It is so easy to loose focus. We are living in an information age. 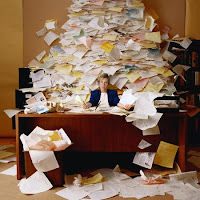 Equals information overload - More information although a great benefit can also confuse and distract. "If you want to dig a big hole, you need to stay in one place. "So many talented people give 1st class allegiance to 2nd class causes that difuse their energy, weaken their impact & waste their lives." In the information age remember that Jesus is the wisdom giver.